Tours depart at 8.30 and 9.00 am throughout the year, daily from April to October and up to 4 times per week from November to March. The Italian Alps can be visited all year. We are comparing Dolomite Mountains, Cortina Day Trip from Venice Prices from leading ticket suppliers and Try to find you Cheap tickets prices on the market. Take a full day excursion away the busy streets and humid air of Venice and head to visit picturesque alpine lakes and quaint mountain villages. This small group tour is ideal for outdoors lovers, families or friend, and for those who prefer to see magnificent scenery without having to hike through it! You will meet with an experienced English speaking guide in Venice, after brief introductions your adventure will begin by taking the mountainous road through tunnels and alongside lush valleys to the ‘Pearl of the Dolomites', Cortina. Here you will have free time to admire the scenery, taste some local food, shop or ride the cable car to Faloria. 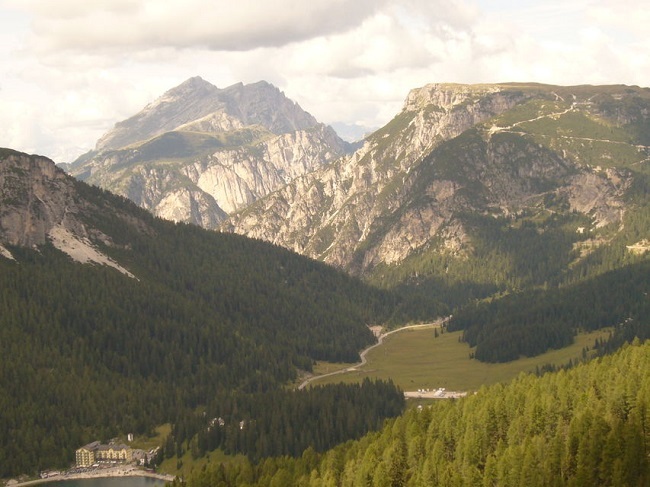 Your day tour will also include visits to Lake Misurina, Lake Auronzo and/or Lake Santa Catarina, taking the road via Le Tre Cime where you will have free time to explore walking trails, enjoy a coffee or take some photos of stunning snow-capped peaks. You will return to Venice in the early evening. An excellent choice is you want to visit Italy's mountains but only have a short time on holiday. This tour will appeal to outdoorsy people and nature lovers. Your Experience With Dolomite Mountains, Cortina Day Trip from Venice? Leave behind the floating city and travel into the beautiful Italian Alps on and a full day excursion from Venice by minivan. Enjoy breathtaking panoramas from Le Tre Cime and visit stunning alpine lakes such as Lake Misurina and Lake Auronzo. Take a stroll in quaint mountain towns and benefit from the small group size and commentary of a local speaking guide. What Dolomite Mountains, Cortina Day Trip from Venice Includes? Round-trip transportation by minibus from Venice. A professional English speaking tour guide/driver. Visits to stunning locations and towns in the Italian Alps. Make sure you bring a camera and hiking boots if you plan to try some of the trails. Don't be shy to ask your guide for recommendations in Cortana. Travelers Reviews about Dolomite Mountains, Cortina Day Trip from Venice? The Dolomites day trip has many 5-star reviews from people who have participated in the excursion. Travellers say that the views are superb and the excursion is definitely worthwhile. TripAdvisor and Viator give this full-day tour has 5 out of 5-star ratings and on Get Your Guide it has a 4.5-star score. Tickets are accepted in mobile or print form. Fee's may apply for late cancellations, this depends on the terms of tour provider. Minimum and maximum numbers apply (2 to 8 people), during low season excursions may be cancelled if there are not enough participants. From November to late May Le Tre Cime may be inaccessible, in this case there will be extra time in Cortina. Weather can be cold and wet, please bring appropriate clothing. Food, drinks and hotel pick-up/drop-off are not included. Excat itinerary depends on the tour provider, you may also make a short stop in Pieve di Cadore. Meeting Point: Piazzale Roma, in front of Hotel Olympia, or Tronchetto Station, Venice.